Data Grids in Evoke can have column headers and footers. These are turned on in the "General Settings" of a Multi Entity Template for multi entity Data Sources. Please see example image right. 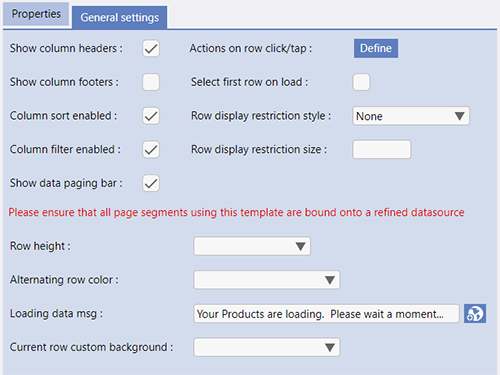 If the "show column headers" checkbox is not ticked then in the WYSIWYG design in Evoke shows the headers as "greyed out". If the "show column headers" checkbox is ticked then each column will have a header as defined in the General Details section against the Property in the Template. An example of column headings appears below. 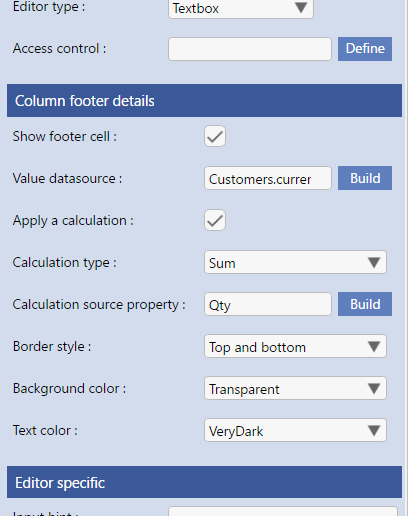 Column footers allow you to automatically add a footer at the bottom of a data grids that can display totals, averages or other calculations of the data in the data grid. 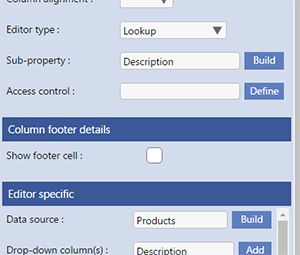 If the "show column footers" checkbox is ticked then each Property in the Template will have a new set of configuration options between the General Details and the Editor Specific settings, called "Column Footer Details". See example screen on the right. In this new section there is the option "show footer cell" - when checked this will add a footer to this column and display multiple new configuration options. Calculation Source Property - The name of the property used in the calculation - defaults to the property in the column.